Jen Braley may be the new owner of JJ’s Market, but she is not new to the market having been the manager for 18 years. Eighteen years ago, the Andover Mini-Mart was purchased by Ed Kerrigan and became part of the Jake’s Market and Deli family of stores. Andover native Jennifer Braley was hired as the manager and has been there ever since. In May, Braley purchased the store from Kerrigan and has renamed it JJ’s Market and Deli. It seems obvious that one of the J’s in the new name would be for Jennifer. The second J is for her husband, John, who does not work in the store on a regular basis, but has been called upon to use his carpentry and maintenance skills around the store. One of his projects has been fixing up a new office for Jennifer in the small space available on the second floor of the market. Braley stated that she has had a good working relationship with Ed Kerrigan and that over the years he had indicated to her that if she was interested, he would be open to selling the store to her. She stated that the transfer has been very smooth with Kerrigan’s help and cooperation. 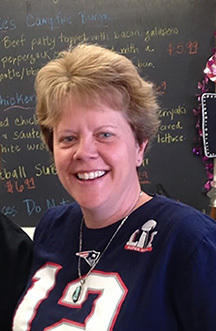 During her time as manager, Braley has overseen the expansion of the deli and the menu offered. The breakfast sandwiches are very popular as well as a variety of lunch offerings, some of which have the locals coming back for on a regular basis. A food warmer has been added so that people can grab food that has been pre-cooked and go without waiting for it to be cooked. The deli is very popular with students from Proctor Academy which is just across the street. There is a pretty steady stream of students crossing the street to grab a snack or a meal. During summer breaks, the campus is busy with Gordon Research Conferences and attendees also like to frequent the market for food or other needs. Open from 6 AM to 9 PM most days, the market requires a staff of about 12 people. It is also one of only two places in Andover to purchase gasoline and diesel fuel and the pumps are busy most of the time. Braley doesn’t plan on making any big changes right away. She would like to be able offer more in the way of fresh bakery items. The store currently sells locally produced maple syrup and barbecue sauce, and she would like to be able to expand those offerings as well. The challenge is finding space within the compact market to accommodate the expanded offerings. Although she has been the store manager right along, being the owner now requires her to spend more time in the office. She misses being downstairs and being with the people, most of which are friends and neighbors. The market has been involved in the community, sponsoring softball teams and the like, and Braley plans to continue those endeavors. A grand opening celebration is planned for June 16 from 10 AM to 2 PM. There will be complimentary hamburgers, hot dogs, popcorn and the like as well as games and activities for children.